I always love finding an opportunity to brag about Fergus. He’s just the sweetest, funniest, most loving little dog. Perfect for me in every way. Well, maybe if he didn’t still get me up at 3 or 4 in the morning because his bladder is about to burst … One hopes as he gets older, that will level out, too. Anyway. This is about how Fergus is my therapy dog. Therapy dogs shouldn’t be confused with assistance or service dogs, by the way. A service dog is specially trained and certified to perform tasks for their disabled human; they are also allowed to go pretty much everywhere with their human, legally protected at the federal level by the Americans with Disabilities Act. On the other hand, therapy dogs don’t have that same regulatory protection or legal recognition. They are not trained to assist individuals in specific tasks. Institutions and businesses may invite, restrict or prohibit access by therapy dogs. 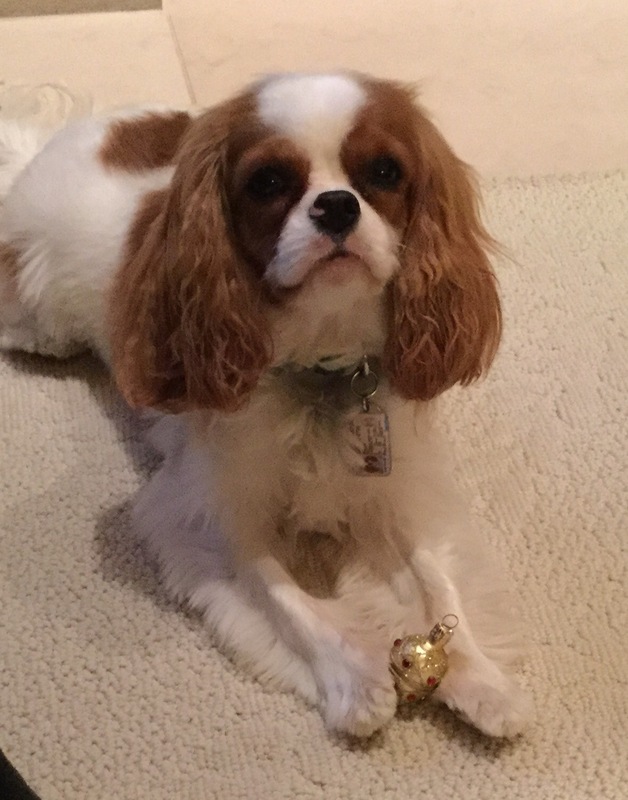 The standards applied to therapy dogs vary greatly – everything from requiring that they complete the American Kennel Club’s Canine Good Citizen test (Fergus hasn’t done so yet) and meet standards for handling specific environments in which they will be working, to buying a kit and a vest and simple registration. In fact, US-based Therapy Dogs International bans the use of service dogs in their therapy dog program. Interesting. When I decided almost a year and a half ago to adopt a dog, I did my research. I’ve never had a dog of my own, I was a rank amateur and I don’t have anyone to help me care for a furbaby. I knew I didn’t have what it takes to rescue a dog; I didn’t have the skills to help a dog that might have special emotional, social or physical needs. I needed a dog that would be easy-ish for a novice to train, that would be a good companion dog and not so large when grown that I might not be able to handle or cuddle him or her. I didn’t really want or need a guard or watch dog, and that’s a good thing because Fergus pretty much kills everyone he meets with adoring kisses. 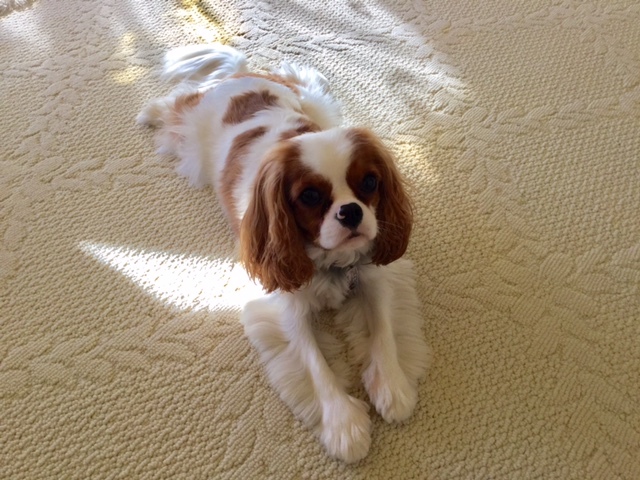 One thing that struck me, as I was reading about Cavalier King Charles Spaniels, is that their temperament is so sweet and devoted that they are often employed as therapy dogs for elderly, sick, hospitalized or institutionalized people. They just can’t stop giving love. I needed that. Since I lost My Darling Husband on November 21, 2013, I have been working on learning how to be on my own. There are ups and there are downs. It’s not easy, I won’t lie. The deep, dark times of sadness and loneliness are less frequent now than they were, but I still have them. You might guess that the past few weeks have been particularly hard and you would be right. I don’t think anyone who’s lost a loved one has an easy time during holidays and key events or anniversaries, but, for me, this will always be a tough period. Such a time caught me unawares the other evening. I was missing MDH so much I didn’t think I could bear it. I started crying and it turned into outright sobbing – a truly ugly crying jag. Fergus climbed onto my lap and gave me a few kisses before settling down to snuggle. He always sticks pretty close to me, but while I was so distraught, he gave me quiet, loving support with no demands that I pay attention to him, play or tend to his needs. He’s doing it now. Recently, Fergus’ vet asked me if he and I would be willing to volunteer one afternoon a week at one of the local elementary schools. This is a group that, at one time, participated in the READ1 program, but when READ began requiring a high level of training and certification for the dog/human teams involved, the local chapter morphed into a less formal group of volunteers. Clare reads to Moppy, an AHF registered therapy dog. From the Animal Health Foundation (California) web site. 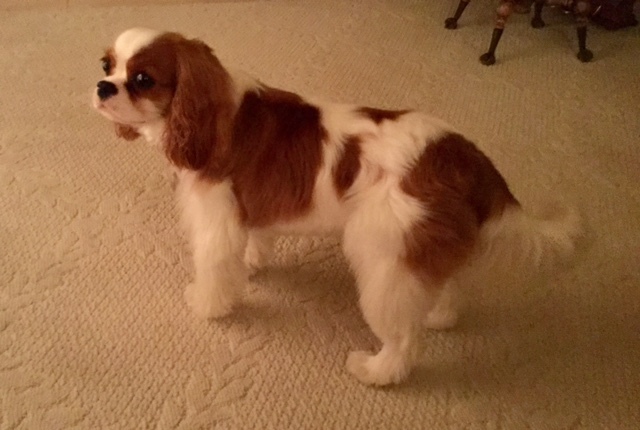 Fergus and I will love spending an hour a week with young people who will appreciate having an opportunity to work on their reading and communication skills with a non-judgmental audience. Hopefully, no one’s feelings will be hurt when Fergus — inevitably — starts snoring. We are all bombarded at this time of year with pleas for charitable donations, but many of us give back to our communities and causes year round. How do you spread the love? 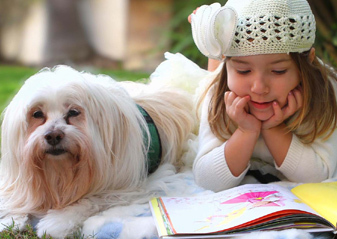 1Reading Education Assistance Dogs (READ) Program is a program that improves children’s reading and communication skills by the simple means of having them read to a dog – a partner who does not judge. READ programs have been started all across the United States, Canada, United Kingdom, Italy, Finland, France, Sweden, South Africa, Slovenia, Spain, Netherlands, Norway and other countries. I do various things throughout the year, but none of them with any consistency, I’m afraid. I’ve just recently signed up for the spring semester “Read Aloud Program” – a partnership among the faculty and staff of BC and the Boston Public Schools and Boston Partners in Education. Volunteers read to students once a month at area elementary schools. I wish I could watch Fergus in action. He’ll be the best ‘reading therapy’ dog ever. I think we’re going to be starting up after the first of the year. I imagine there will be a blog post in there somewhere! Thank you, Sally. Fergus is an endless source of entertainment and comfort for me. Like you, I can’t imagine life without him, now! Leave a reply on "Spreading the Love"